Givenchy 1 Top Coat Blanc Satin Ombre Couture Cream Eyeshadow review and photos. Givenchy 1 Top Coat Blanc Satin Ombre Couture Cream Eyeshadow. 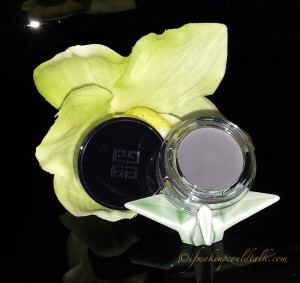 Since my success with Givenchy 7 Gris Organza Ombre Couture Cream Eyeshadow (here), I decided I needed to explore other colors from the range. The two colors that caught my eye were 2 Beige Mousseline and 1 Top Coat Blanc Satin Ombre Couture Cream Eyeshadows ($23 USD/ 4g). Givenchy 2 Beige Mousseline is a neutral soft brown matte color with delicate silver shimmers throughout the formula. 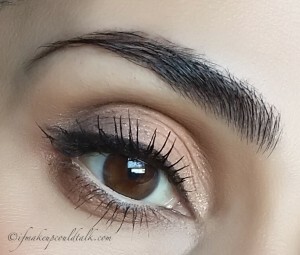 A beautiful color in its own right, however, the color was so close to my natural coloring, it almost seemed as if I was wearing nothing on my lids (reminded me of Nars Voyage Eyeshadow). On the other hand, Givenchy 1 Top Coat Blanc Satin proved to be quite a versatile color. 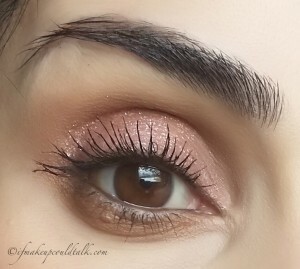 Pairing this sparkling treasure on top of any matte eyeshadow will add subtle dimension and interest to your look. 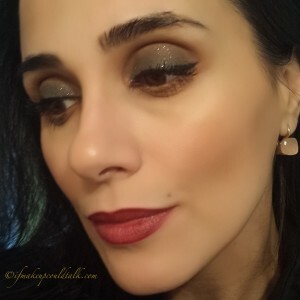 Givenchy 1 Top Coat Blanc Satin Ombre Couture Cream Eyeshadow over Bobbi Brown Shore Cream Shadow. Everything I stated about Givenchy 7 Gris Organza can be applied to Givenchy 1 Top Coat Blanc Satin. 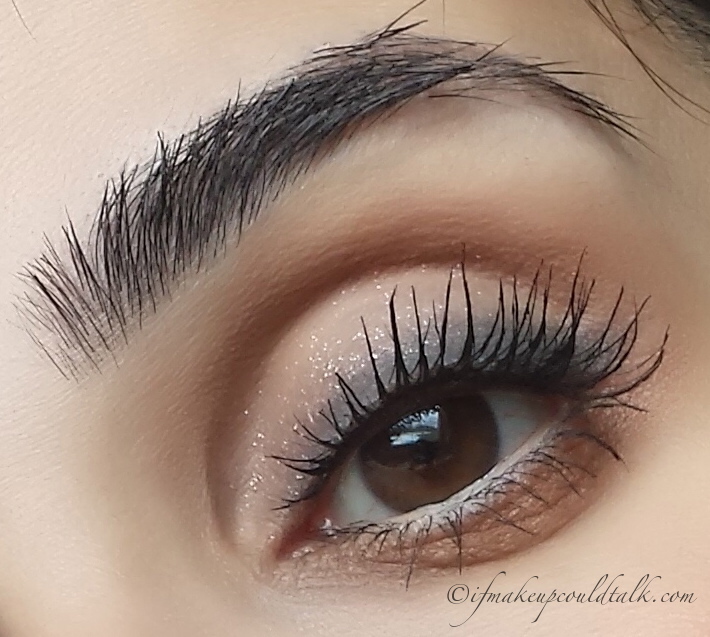 The sparkles are so finely milled, they feel completely undetectable during application and wear. The formula used to bind the sparkles to the clear base is outstanding. There is ZERO sparkle fallout with all three shades I tested. In addition, upward sparkle migration to the crease was so minimum, I feel silly for even broaching the subject. During the 11 hours I wore Givenchy 01 Top Coat Blanc Satin, I did not experience any fading or sparkle fallout. Givenchy 1 Top Coat Blanc Satin Ombre Couture Cream Eyeshadow can be applied over any powder or cream eyeshadow, depending on the look you are going for. The delicate silver sparkles pairs very nicely with a variety of eyeshadow colors. In addition, I found the silver sparkles complimentary to both warm and cool skin tones. Givenchy 1 Top Coat Blanc Satin Ombre Couture Cream Eyeshadow over Giorgio Armani 10 Beige Blush worn as an eyeshadow. Application is fairly easy and straight forward. Since Blanc Satin is a topper shade, I prefer to use a synthetic brush as opposed to using my fingers (they are too large to give me precise sparkle placement). Waiting the obligatory 30 seconds between layers is especially important, to avoid uneven patches. Personally, one layer is more than sufficient for my liking. Givenchy 1 Top Coat Blanc Satin Ombre Couture Cream Eyeshadow over Givenchy 7 Gris Organza. When Givenchy 01 Top Coat Blanc Satin was placed on top of Givenchy 7 Gris Organza, the overall effect was enchanting as opposed to outrageous; after all, this is Givenchy we are talking about–not Illamasqua (not that there is anything wrong with Illamasqua). Givenchy 1 Top Coat Blanc Satin Ombre Couture Cream Eyeshadow over Nars Smudge Proof Base and & Givenchy 7 Gris Organza. Givenchy 1 Top Coat Blanc Satin can look very chic if applied straight to the lids (primed with an eyeshadow base first) with just some mascara and a fantastic red lipstick. 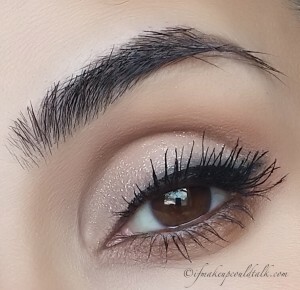 This look would be ideal for individuals with smaller lid space to really accentuate their eyes. In the spirit of full disclosure, I have since returned Givenchy 2 Beige Mousseline, not for lack of performance, but simply because the color did not suit my coloring. Luckily, I have gotten in the habit of photographing all my cosmetics before I use them, so I have a fairly good shot of what the color looks like and how it wears. 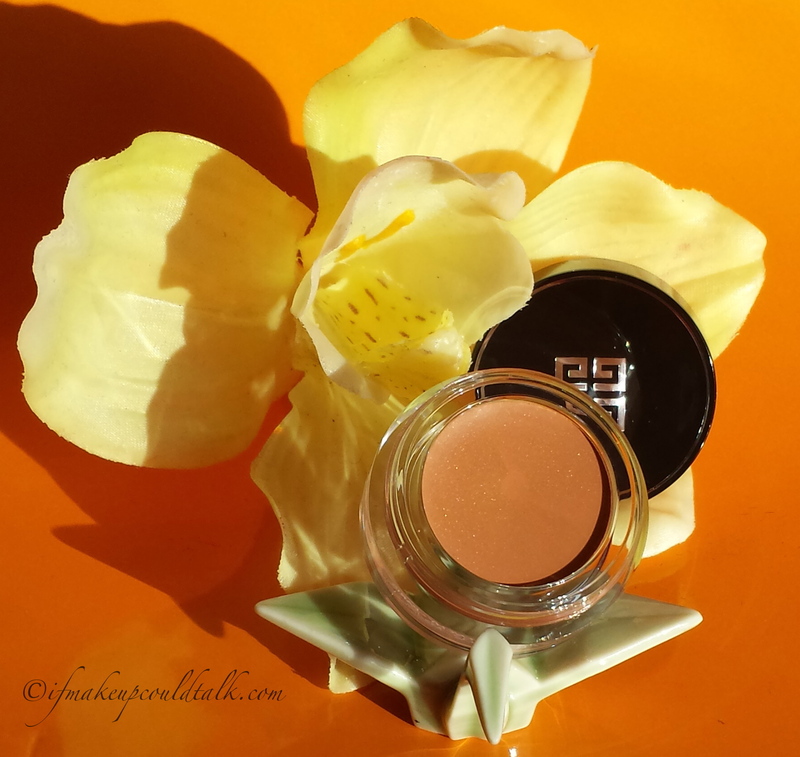 Givenchy 2 Beige Mousseline Ombre Couture Cream Eyeshadow. 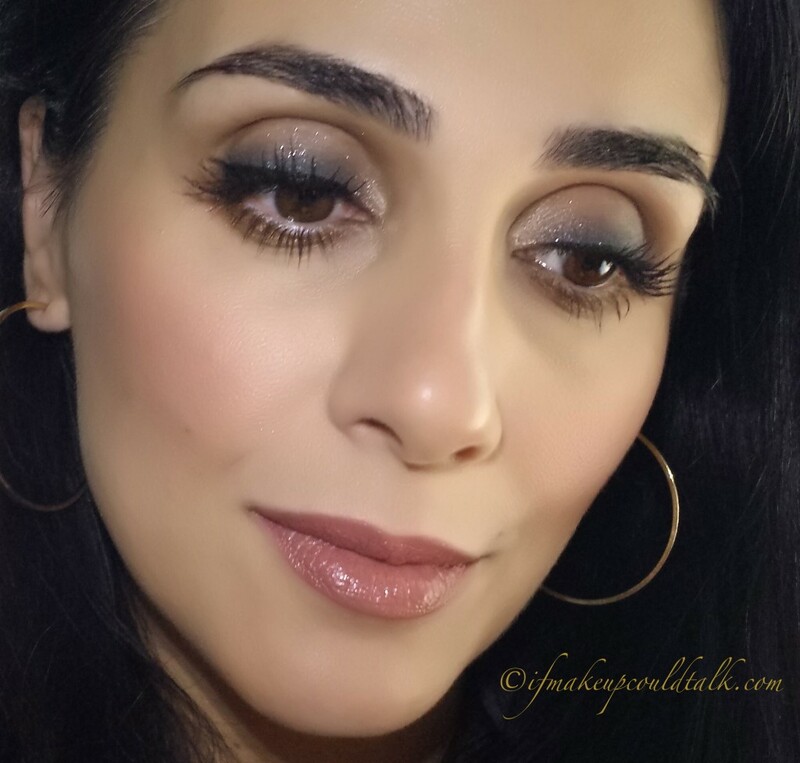 Givenchy 2 Beige Mousseline Ombre Couture Cream Eyeshadow on the lid with Clarins Dark Chocolate in the outer “v” and 1 Blanc Satin in the inner corner. Isododecane, Synthetic Fluorphlogopite, Dimethicone, Phenyl Trimethicone, Calcium Sodium Borosilicate, Dimethicone/Vinyl Dimethicone Crosspolymer, Hydrogenated Polycyclopentadiene, Hydrogenated Castor Oil, Sorbitan Sesquiisostearate, Silica, Polyethylene, Carnauba Wax, Phenoxyethanol, Boron Nitride, Microcrystalline Wax, Tocopherol, Tin Oxide, BHT, CI 77891 (Titanium Dioxide). Givenchy Cosmetics are sold at Sephora and givenchybeauty.com (however, at the time of this post, they have yet to list these shadows on their website). 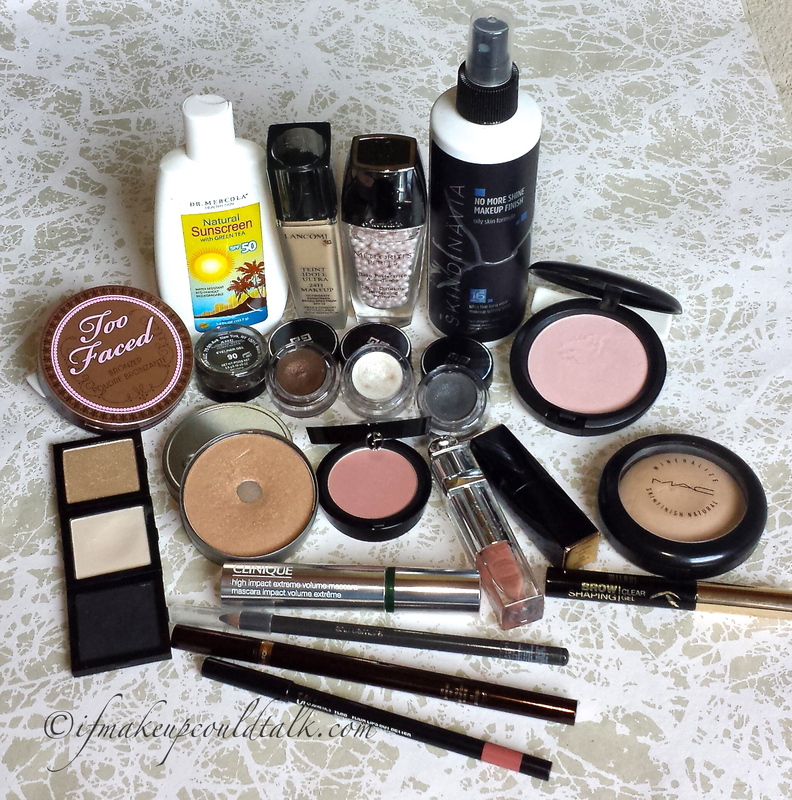 Makeup would tell you Givenchy 1 Top Coat Blanc Satin Ombre Couture Cream Eyeshadow is an excellent topper shade. The longevity, smooth lightweight texture and lack of sparkle fallout demonstrates excellent quality. I cannot stress how impressed I am with Givenchy Ombre Couture Cream Eyeshadows; I foresee a few more colors in my future. 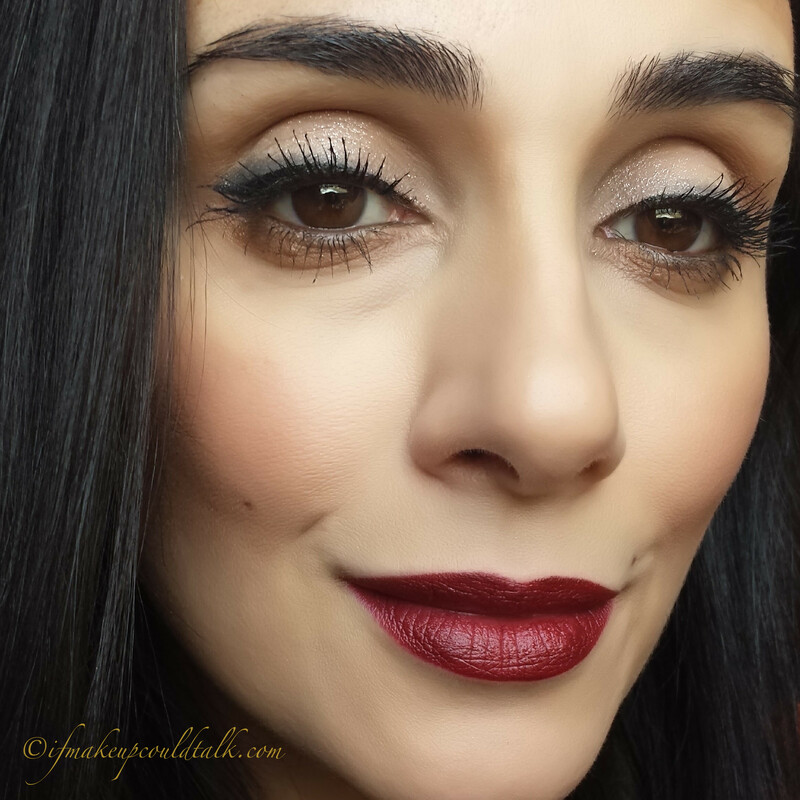 Up next, Estee Lauder Decadent Pure Color Envy Lipstick review. Be well and stay safe. Givenchy 7 Gris Organza Ombre Couture Cream Eyeshadow review and photos. 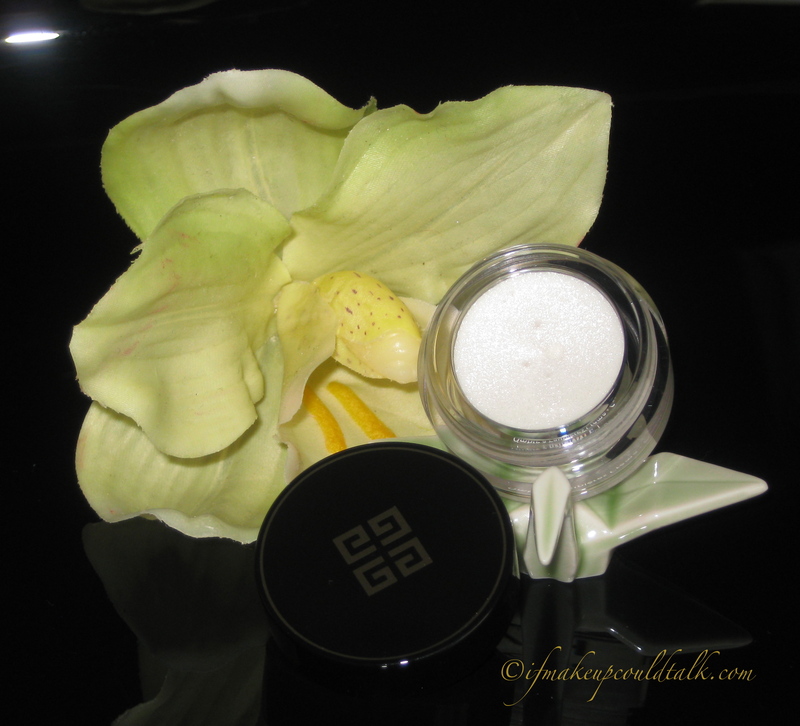 Givenchy 7 Gris Organza Ombre Couture Cream Eyeshadow. 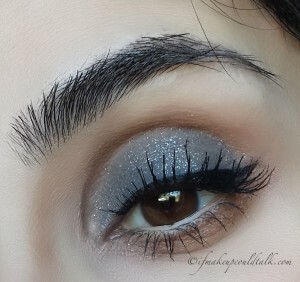 Beautiful matte gray color with delicate silver micro sparkles running throughout. 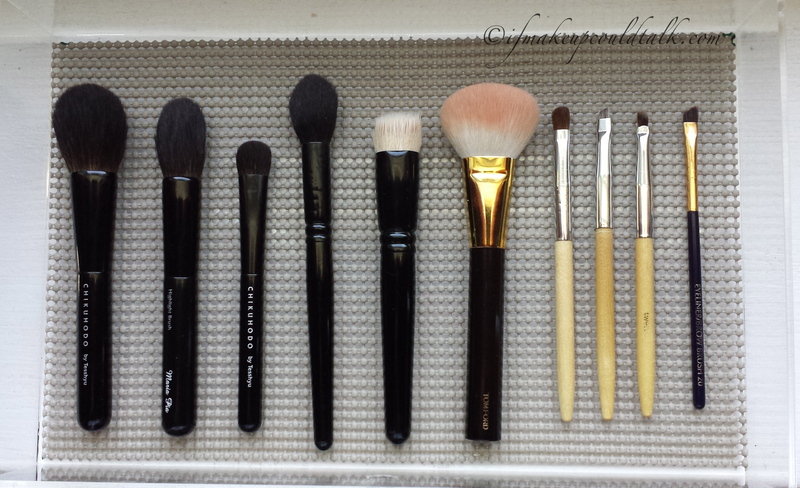 Lightweight formula applies smoothly with fingers or a synthetic brush. Cream-to-powder formula dries down to a velvet matte finish. G-O-R-G-E-O-U-S!! 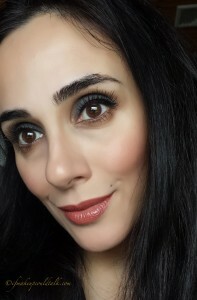 Stays put all day long with ZERO sparkle fallout when paired with Nars Smudge Proof Eyeshadow Base. Delicate silver sparkles do not migrate upwardly. Delicate silver sparkles keep this shadow from appearing too flat. The rich dense base color dominates the sparkle thus, making the eyeshadow appropriate for more mature lids and an office environment. Formula does not dry down quickly, making blending out edges a pleasure. Can be applied lightly for daytime wear. The color can be built up in thin layers for opaque color payoff. Fantastic amount/price ratio for such a high-end brand. Small lightweight packaging is travel friendly. Does not contain parabens or mineral oil. Slight teal undertone may cause Gris to look more blue/gray on certain skin tones. Acrylic packaging may cause product to dry out quicker than a glass container. Only two completely matte colors are offered ( 3 Rose Dentelle and 5 Taupe Velours). No other cons…that’s how wonderful 7 Gris Organza has performed. Givenchy 7 Gris Organza Ombre Couture Cream Eyeshadow in natural lighting (9:00 am). 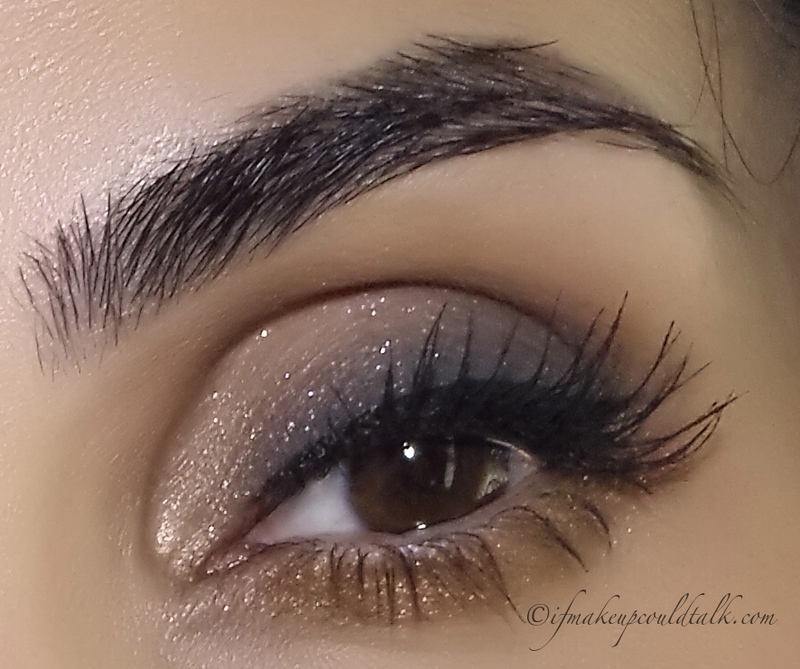 Givenchy 7 Gris Organza Ombre Couture Cream Eyeshadow in bathroom lighting (9:30 pm). The above photo was taken at 9:30 pm. I do not know how Givenchy did it, but the silver sparkles adhere to the skin seamlessly and do not budge for the duration of the day. I applied three layers to achieve the color payoff seen in all photos, with a 30 second dry time between each layer. The 16 hour claim could very well be true, during the 12½ hours I wore Gris, I did not experience any fading or sparkle migration. Isododecane, Dimethicone, Synthetic Fluorphlogopite, Phenyl Trimethicone, Dimethicone/Vinyl Dimethicone Crosspolymer, Hydrogenated Polycyclopentadiene, Hydrogenated Castor Oil, Sorbitan Sesquiisostearate, Silica, Polyethylene, Carnauba Wax, Phenoxyethanol, Disteardimonium Hectorite, Boron Nitride, Microcrystalline Wax, Propylene Carbonate, Tocopherol, BHT. May Contain (+/-) : Calcium Sodium Borosilicate, Tin Oxide, Ci 77891 (Titanium Dioxide), Ci 77491 – Ci 77492 – Ci 77499 (Iron Oxides), Ci 77007 (Ultramarines), Ci 75470 (Carmine), Ci 19140 (Yellow 5 Lake), Ci 77510 (Ferric Ferrocyanide). Makeup would highly recommend you check out Givenchy Ombre Couture Cream Eyeshadows next time you are visiting your local Sephora. The texture, finish and look of these beauties are wonderfully sublime. 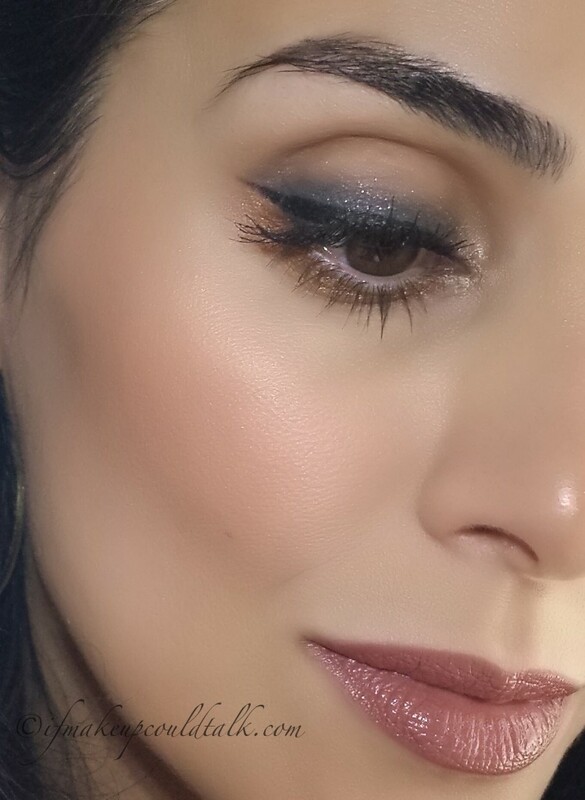 I happen to love the look of a matte eyeshadow with delicate sparkles scattered throughout the formula. 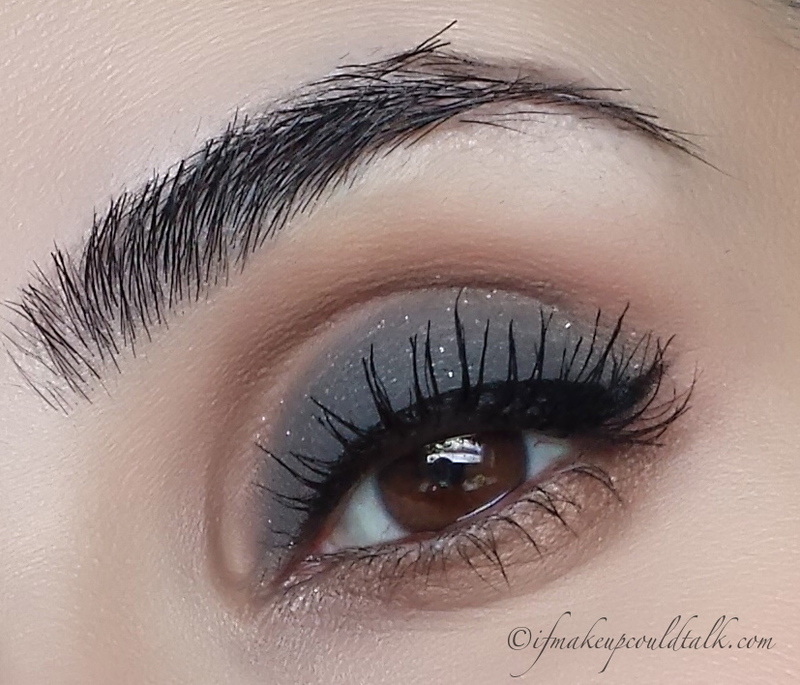 IMHO, Givenchy 7 Gris Organza is amazing; nothing beats the look of a good gray eyeshadow. I believe my next Givenchy Ombre Couture Cream Shadow will be 1 Top Coat Blanc Satin. What will you be getting? Be well and stay safe.